Description This is a Course for Beginners. We will take one step at a time - set individual and realistic goals so you can learn to paint in a style that fits your personality. This is a small class with individual guidance. Acrylic paint is very forgiving and is ideal for a beginners course. Objectives To develop a foundation to build upon. To gain confidence as you gain knowledge. To begin to understand how to paint what you see and what you feel. Teaching Process Examples, Demonstrations, Hands on and Q&A. Additional Costs or Information Materials are extra - A list with images will be sent to those who enroll. Has taken a wide variety of classes and workshops in design and color theory. She is passionate about Color and Texture for conveying mood and emotion. 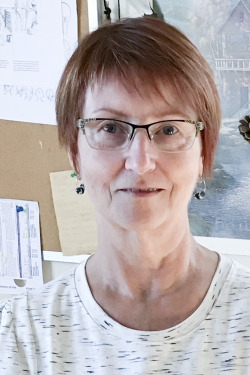 She has participated in group shows and solo exhibitions and has taught Color Mixing, Abstract Techniques, Intuitive Painting, Photography Basics and Principles of Design.